We have already discussed one example in the previous post, so we start with the second example. What is the area of a trapezoid whose parallel sides measure 6 cm and 8 cm and whose altitude is 2.5 cm? In this example, the parallel sides are the base, so we can substitute them to and . Since we are looking for the sum of and , we can substitute them interchangeably. The term altitude is also another term for height. So, , and . So the area is square centimeters. Be Careful! : Again, remember that if we talk about area, we are talking about square units, and in this case square centimeters. If you choose an option which is 17.5 centimeters, then it is WRONG. It should be 7.5 square centimeters! 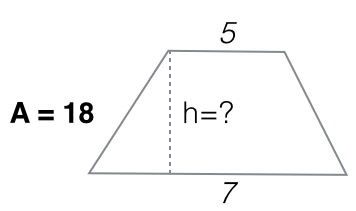 Find the height of a trapezoid whose base lengths are 5 and 8 units and whose area is 18 square units. In this problem, we look for the height. But don’t worry, we will still use the same formula, and manipulate the equation later to find . So here, we have , , and . 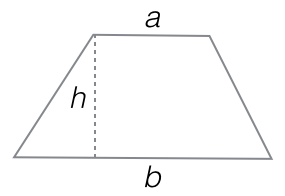 So, the height of the trapezoid is 3 units (not square units!). In the next post, we will have two more examples. Note: If you have a hard time understanding the solution, or particularly solving equations, you should read the series on solving equations. In example # 3, it was given in the question that the base lengths were 5 and 8 units but on the figure below, lengths were 5 and 7. Which is true?